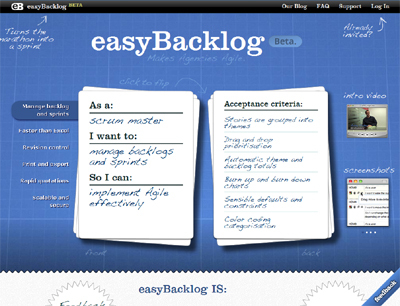 easyBacklog is an agile backlog management tool designed for agencies or companies delivering agile projects with fixed resources. easyBacklog reduces time spent managing backlogs, controls project overrages, provides real time reporting and simplifies sprint management. This product is not another project management or project collaboration tool, it is meant for scrum masters and project managers, and it does not attempt to replace the real world interactions that are still required to make agile projects effective, it simply enhances them. * Simplicity in the interface. * Snapshots allow you work in an agile way whilst keeping track of how the backlog is evolving so you can report on cost or timing impacts to your clients.